A python script was created to collect domestic and foreign box office data for every country available on boxofficemojo.com – for the top 100 domestic films in 2011, 2012 and 2013 (300 films total). This plot shows the non-U.S. total (all countries combined) for each of the 300 titles and their fairly strong correlation (r^2=0.71) with domestic performance. A breakdown by country will be discussed in the next HollyQuant post (very interesting findings there). This means that while U.S. box office may be losing ground in terms of global market share (see older post on that), it’s still a good indicator of international box office performance. 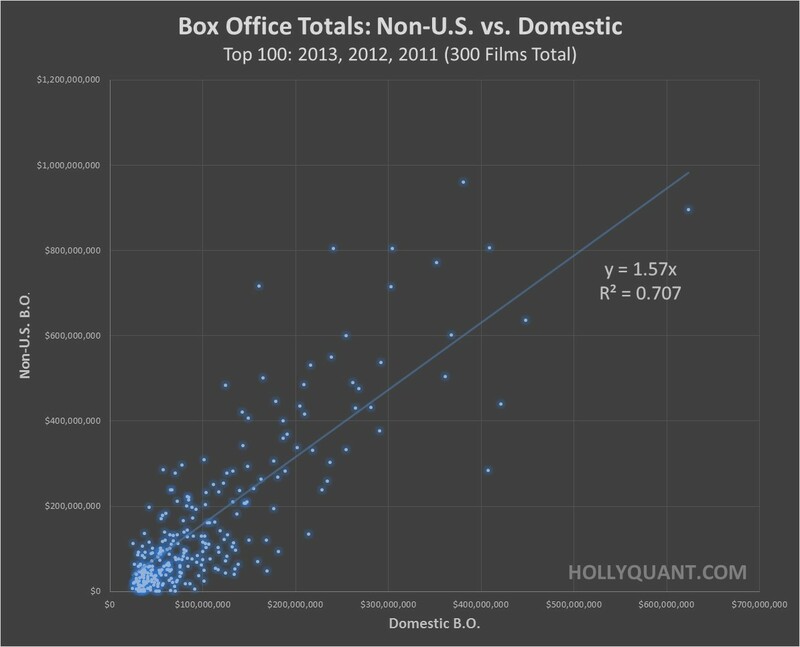 While we keep in mind that correlation is not causality (therefore, we should not conclude that U.S. buzz is a direct factor of international success), what we can say is that if the film was made by serious people who properly marketed it in the US, it has very good financial prospects abroad. Every gross dollar earned domestically translates into an additional 1.57 dollars in total foreign grosses. Of course there are always outliers (Disney’s ratio is probably better than Lionsgate’s for now), but if you were to blindly choose a bunch of random titles, this would be a good estimate. The next post will discuss the super interesting finding regarding the correlations of domestic performance and performance in each specific country.